My outfit looked super plain until I began to add little accessories. They really added up to make these basics look decently put together. Because I used to wear big statement necklaces so often, I get questions about more subtle or less colorful pieces that can still make a difference. Lately I’ve been wearing this Daniel Wellington watch that’s perfectly sleek and modern but timeless at the same time. (Get 15% off with code puttingmetogether.) I’ve also been wearing a gold chain bracelet that adds a tiny touch of femininity and polish. The one I’ve been wearing is stamped with Addie’s name, plus Benson’s and my wedding anniversary. I’d love to add more stamped washers with more kids’ names whenever we expand our family! The one on the right can be customized with a bunch of different colored stones, and you can add as many initials as you want. I chose pink opal because like I mentioned last week, I’m digging pale colors more than ever! The best part is that all proceeds from Sela Designs go to a charity that supports children in Ethiopia! 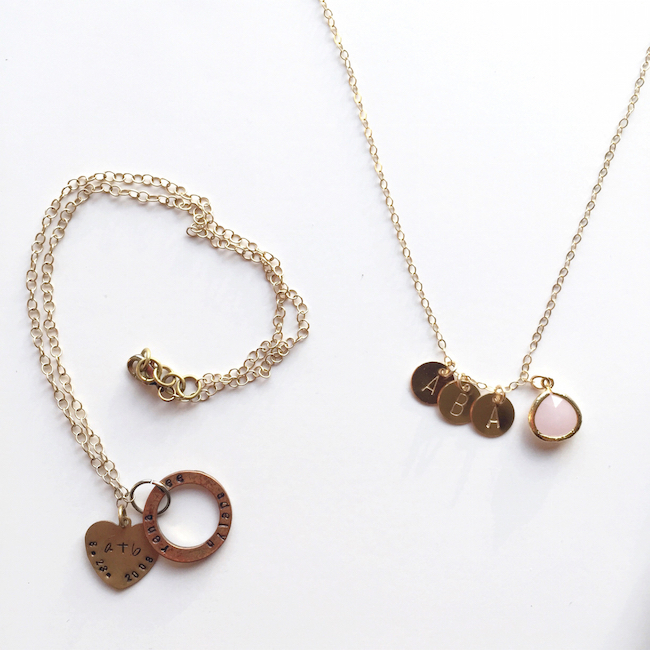 You can get your mom a personalized and meaningful gift while supporting a great cause. Head over there and check out all of Ashleigh’s jewelry! 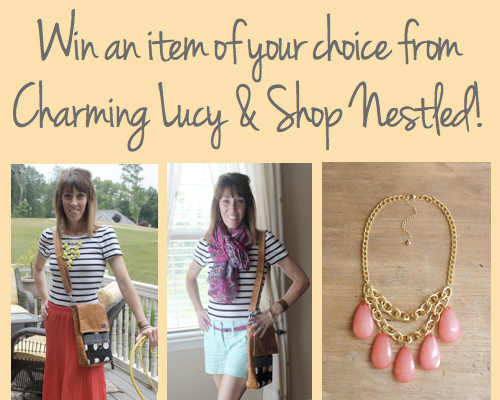 Win an item of your choice from Charming Lucy & Shop Nestled! That necklace is adorable, and I love your hair in curls! 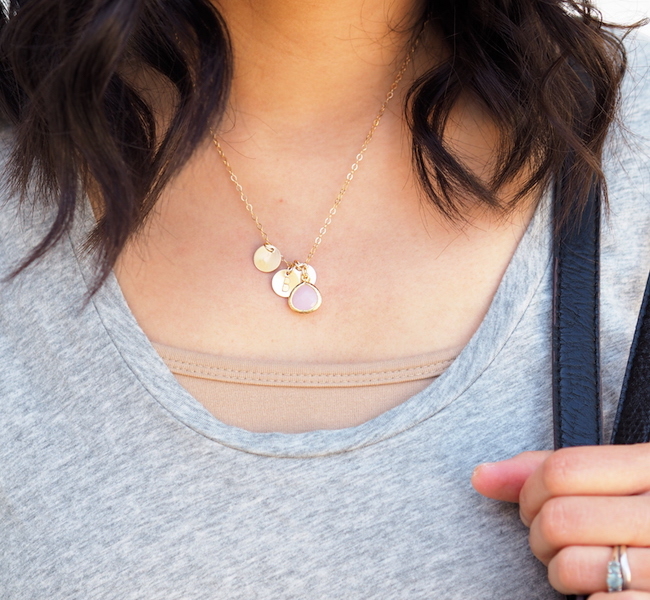 It's the most delicate of pieces that often add the most punch to an outfit. I'm with you. As much as I want to "wear all the colors" my closet is mostly composed of neutrals now so it's all about the accessories. Love your outfit Audrey and I'm loving your hair. What kind/brand of curling iron are you using? Thank you. 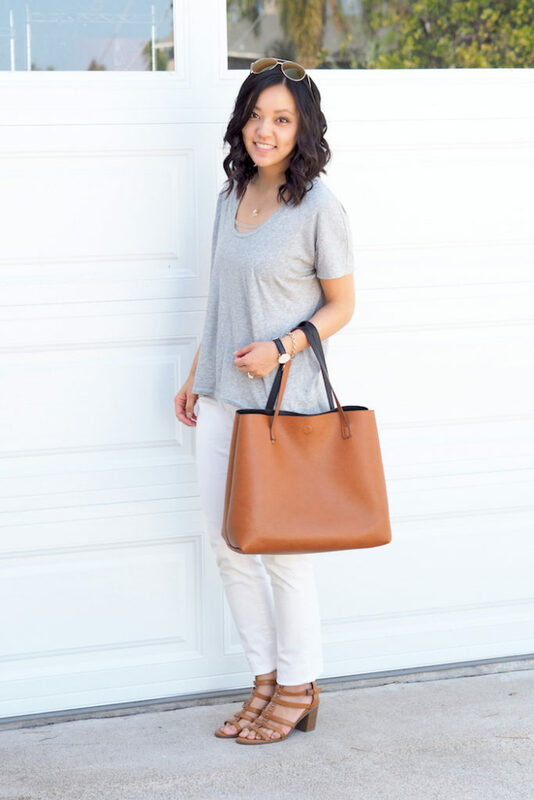 I love wearing neutrals and these accessories are perfect! I've been eyeing everlane shirts, but have yet to purchase one! The look is subtle, but super stand out! The tote and the shoes tie it all together. Well done! I have always loved your sitr – so much helpful information. I have a question – what is your "cover up" and where did you purchase it? By coverup, I mean the skin colored piece of fabric under your gray T. I remember reading that you always wear some kind of camisole under your shirts in case they are either too sheer or the neckline is lower then you would like. Lately I've been wearing nursing tanks from Undercover Mama. Before I was nursing I just wore Old Navy camis without a built in bra. This is totally my kind of outfit! I would wear it in a heartbeat! In fact, I think I need to copy this look 🙂 Love your necklace too! I just love items that having meaning to them! I love this look. I dress myself around really basic pieces and then accessorize! Love the fit of that shirt! What size are you wearing? This is a great look! Can I ask what size everlane shirt you're wearing and how does the fit/size compare to their v-neck tees? Thank u! 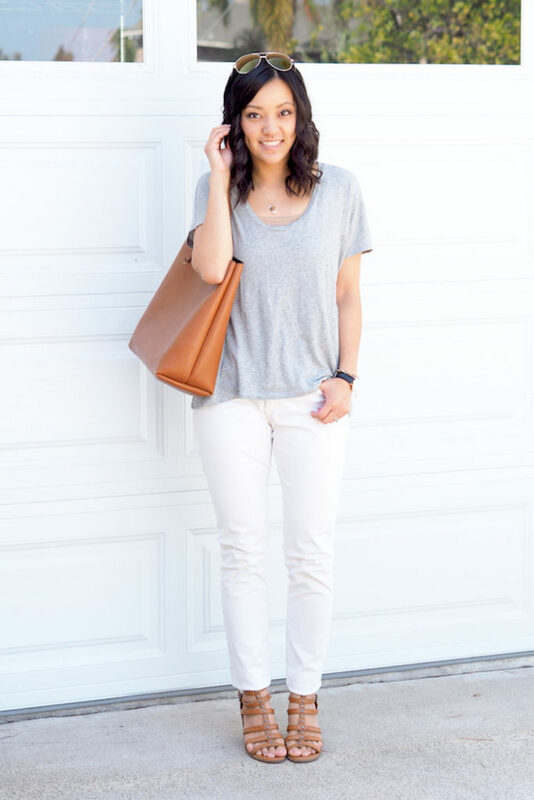 You make neutrals look so chic! 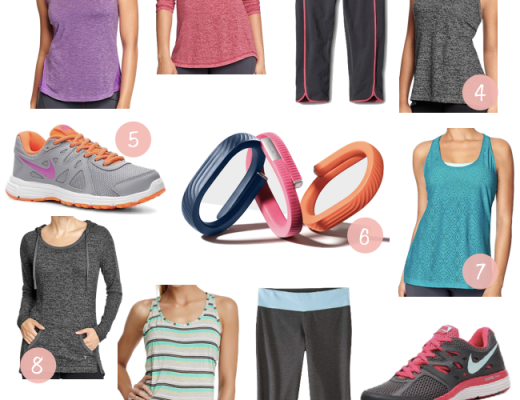 I have a tough time with a total neutral outfit (maybe because of my size?) but I just feel too out there. A great delicate necklace. Hi Rae! I can't remember for sure since I'm out of town and don't have the shirt with me, but I looked back at my order invoice in my email. I'm wearing Small, and I *think* in v-neck tees I normally wear Medium. The U-neck fit is a lot looser than the V-necks. Even sizing down in the U-neck, the U-neck small fit is looser than the medium V-neck. It's also a little higher in the front and slightly longer in the back. Oh I'd love that necklace for my baby's initials! Your outfit looks super comfy! Thank you soo much for getting back to me! That was so nice of you and I really appreciate it. 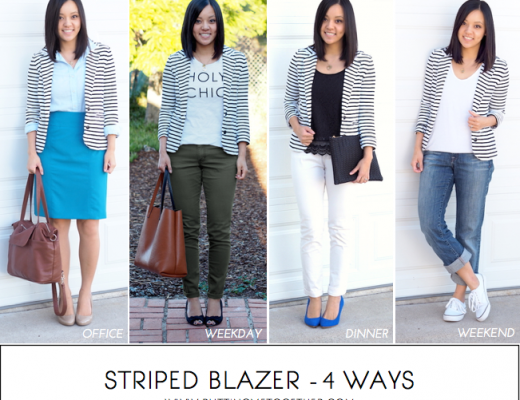 You have a great blog and I've been very inspired by your outfits and fashion sense. Thank you again! Hi Julie! I don't think it'd be good for someone who is pregnant unless you carry extremely low. I think you're right about it cutting across the belly. I'd go for option #2 instead and belt it above the bump. What a cute look!! I love that dress on you! I ordered this dress in the navy polka dots after I saw your Instagram post and I loved it so much I ordered another one in gray last week. I really appreciate this picture of it though. I'm terrible about styling necklaces and this gives me a great place to start! Great simple dress!!! Love this look! Nice look, nice present idea! Personalized gifts are the best, like the compositions on musicalnames.com, which always make a great impression! I need this dress in my life. It looks so comfy and chic! Love that bag too! Not sure if you've heard of Latched Mama yet but you should take a look! http://latchedmama.com/ it's my friend's company, and it's cute, comfortable clothes for nursing moms! I have several friend's who've ordered things from her and love them. I fell in love with that dress in gray when I tried it on in Old Navy a few weeks ago. This is just making me want it more! catching up on your blog. you are just the cutest and I LOVE your style and outfits! !